Mr. Berry, partner in Berry & Berry, PLLC has been representing security clearance clients since 1999. He has represented security clearance applicants and holders before practically every federal agency, from the Department of Defense, the Department of Energy to the Department of State to the various intelligence agencies like the Central Intelligence Agency (CIA), National Geospatial Agency (NGA) and National Reconnaissance Office (NRO) and the National Security Agency (NSA). Mr. Berry is licensed in the District of Columbia, Commonwealth of Virginia, State of Maryland, State of New York and the State of Michigan. Mr. Berry represents security clearance clients nationwide before the various federal agencies that adjudicate security clearances. He is also the author of the Security Clearance Blog. 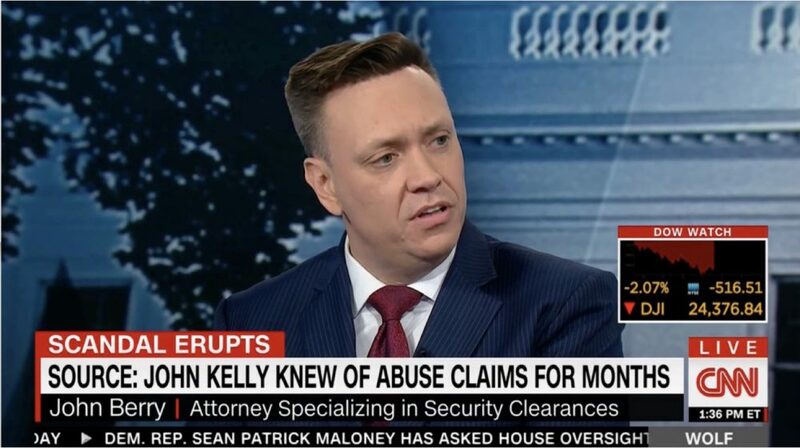 He has been interviewed by CNN, ABC and other networks, in addition to being published by a number of newspapers, including the Washington Post on his views regarding security clearances. Mr. Berry’s Twitter Account, discussing security clearance issues, can be found here. Ms. Berry, a partner in Berry & Berry, PLLC, focuses on security clearance issues as they impact private sector employees. She has been practicing law since 1998. Her practice focuses on the impact of security clearance issues in the context of severance agreements, separation agreements, and at-will employment. She has advised and represented numerous private sector employees on the impact of separation agreements in the context of security clearance issues. Ms. Berry is licensed in the Commonwealth of Virginia, State of Massachusetts and the State of Maine. Ms. Maloney’s practice includes the representation of security clearance clients before the Defense Office of Hearings and Appeals (DOHA), the Department of Defense Central Adjudication Facility (DoD CAF), a number of intelligence agencies (IC) and other federal agencies. Prior to joining the firm, Ms. Maloney worked as a staff attorney for Catholic Charities Legal Network, a non-profit pro bono case placement organization with an office in the District of Columbia. Ms. Maloney began her legal career as an associate at a District of Columbia law firm specializing in administrative due process matters on behalf of students with disabilities. She remains actively engaged in pro bono work on various poverty law issues as a volunteer with Christian Legal Aid of the District of Columbia. Prior to her legal training, Ms. Maloney studied and worked overseas for a period of about 10 years, having lived in Belgium, the Republic of Ireland, Scotland, and England. Originally from the Chicago area, Ms. Maloney is proud to call the United States her home and is passionate about pursuing justice for her clients. Ms. Maloney is licensed to practice law in the District of Columbia, the State of North Carolina, and before federal agencies nationwide. Ms. Watkins’ federal practice focuses on cases before various administrative agencies as well as security clearance cases before the Defense Office of Hearings and Appeals (DOHA), the Department of Defense Central Adjudication Facility (DoD CAF) and other federal agencies involving security clearance matters. Prior to joining the firm, Ms. Watkins worked as an attorney advisor for the Board of Veterans’ Appeals, the appellate division of the Department of Veteran’s Affairs, authoring appeals decisions to resolve cases arising from Veterans benefits disputes. During law school, Ms. Watkins worked as a legal intern with the Department of Justice, Bureau of Prisons, providing legal support to DOJ attorneys on a variety of cases involving matters such as correctional law and litigation, civil rights disputes, mental health hearings, and FTCA claims. Prior to her legal training, Ms. Watkins obtained her undergraduate degree from Wake Forest University where she double majored in History and Political Science. While attending Wake Forest, Ms. Watkins also participated as a member of the University’s Equestrian Team. Ms. Watkins is licensed to practice law in the District of Columbia and before federal agencies nationwide.